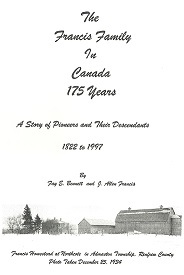 [S467] Francis Genealogy, Mary Holmes and J. Allen Francis, (Name: N/A;). [S105] Census - Canada, Ontario, Addington Co., Clarendon & Miller - 1881. [S951] Wolford Cemetery, Grenville County, Transcription of Stones. [S856] The Marriage Registers of Upper Canada/Canada West Vol 8 Part 1 Johnston District 1799-1851, p. 12 (Reliability: 3).